Process flow diagram, for convenience sake, many people call it PFD. PFD shows the relationships between the major components in the system. PFD also tabulate process design values for the components in different operating modes, typical minimum, normal and maximum. What's a process flow diagram? Process Flow Diagram, which is also known as process and instrumentation diagram, is a schematic illustration in the process industry showing the piping of the process flow together with the installed equipment and instrumentation through graphical symbols. It shows how industrial process equipment is interconnected by a system of pipelines, which is required by engineers to start planning for the construction of a plant. Why process flow diagram is important? 1. It allows different business units to see what their roles are in a process. 2. It helps to identify non-value-added operations and facilitates teamwork and communication. 3. It is simple to create, easy to understand, and helps preserve the practices that make your business work. 4. Its visual representation of processes allows those who are not familiar with the process to understand how it works and more importantly to see where there are disconnects. How to Create a Better Process Flow Diagram? In Edraw, the Process Flow Diagram Template helps you easily create process flow diagrams using massive built-in symbols. Double click the template from Engineering Category on the starting page to enter the drawing page. 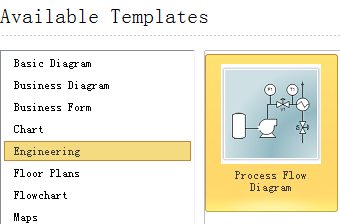 You will discover abundant symbols and easy-to-use tools available for process flow diagrams. 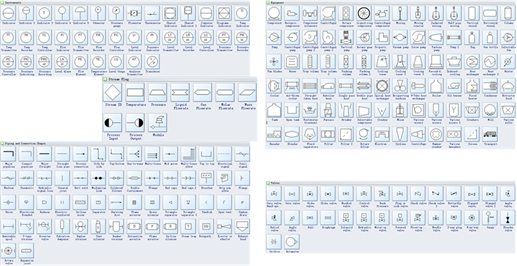 Edraw includes more than 2000 vector PFD symbols created from different international standards. In Edraw library, all PFD symbols are classified into groups as equipment, valves, piping and connection shapes, stream flag, instruments, etc., which you can easily use to depict mechanical equipment, piping, piping connection, valves, equipment drivers and instrumentation and controls. Go to Process Flow Diagram Symbols page to have a general knowledge about the symbols. 1. On the File menu, point to New, point to Engineering, and double click Process Flow Diagram template. A new drawing page will open. 2. Go to the library pane on the left of the canvas. From Equipment, drag equipment shape onto the canvas. 3. Use pipelines to connect the equipments. 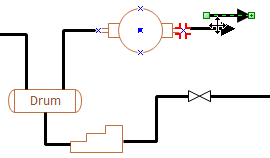 Drag a pipeline from the Connection Shape onto the drawing page. Position an endpoint with an equipment shape. Connection points (blue x) will appear on the equipment shape. You can connect with any connection point as you want. When the endpoint turns red, it means it's glued to the equipment shape. Note: Connection point can be created through Connection Point Tool under Home tab if you need. Drag the other endpoint to another equipment shape as above. Pipeline style is changeable if you need a special line weight or arrow direction. Go to Home tab Line button to set the pipeline style. 4. You can add valves and instruments in the same way. 5. Rotate a shape through the rotation handle when it's selected. 6. Reposition a shape by dragging it to the required place. 7. Add data to a component by double clicking on it. Print: When a process flow diagram is done, it's easy to print and share with more people. On the file menu, point to Print to set for print options. You can change settings with fewer clicks and see the print preview in real time. 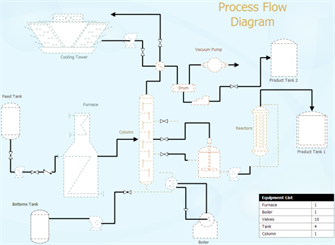 Here is a complete example of process flow diagram created by Edraw.